Evolver is one of the better R&B albums of 2008, and Legend goes a long way towards proving himself as a jack of all trades. Anthony Hamilton may have the better voice. Ne-Yo might write better songs. However, when it comes to smooth, mature R&B, John Legend is the man to beat. The protégé of Kanye West, Legend has amassed strong sales and critical kudos for his first couple of albums, Get Lifted and Once Again. He’s become known as the R&B singer you can take home to mom, a piano man in the mold of Lionel Richie and Brian McKnight. However, he’s got a more pronounced hip-hop vibe and a wink-nudge, sly sexuality that‘s a refreshing change from the crass sexuality found in most R&B and hip-hop lyrics these days. This summer, as the release of Legend’s third album, Evolver, approached, the singer talked it up as a bit of a departure from the classy ballads he was known for. First single "Green Light" suggested a departure indeed. Spacey '80s synths and a rap from the irrepressible Andre 3000 contributed to make this bouncy, danceable jam a hit. With Evolver finally in stores and online, two questions need to be asked. 1) Is the entire album a departure for John Legend, and 2) Can he make it work? The answer to the first question? Well, yes-the album is a departure if you compare it to the lounge-y Once Again. However, there was a strong hip-hop influence on Get Lifted, and Evolver is basically a better-produced, more eclectic version of his debut. It has a danceable, midtempo vibe that will appeal to the exact same people who already buy his music. So it’s not a departure in the sense of “John Legend Goes Gangsta”, but if all you know of Legend is his hit single "Ordinary People", then you’ll be in for a bit of a start. Any great artist knows that in order to not shock their fans too much, they have to temper any “experimentation” with a little bit of what they do best and Evolver’s best songs are, you guessed it, the ballads. Two stick out immediately. "This Time" has to be one of the best songs Legend’s ever written and performed, with a majestic, cinematic quality. No doubt that’s due to the usage of former Yes-man Trevor Horn as a co-producer. I would be quite intrigued to see what Horn could do with Legend over the course of a full album. The other spectacular ballad is "If You’re Out There", a political-tinged “up with people”-type song that Legend performed for Barack Obama at this year’s Democratic National Convention. 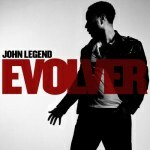 The remainder of Evolver manages to successfully incorporate a few different styles while staying true to John Legend’s sound. It’s contemporary without sounding desperate. Highlights include the dramatic Brandy duet "Quickly", where the former teen diva and the piano man improbably match up quite well. There’s also a couple of reggae-flavored tunes that suggest Legend has gotten the island fever. "No Other Love" is a grooving, melodic jam with a quick cameo by Legend discovery Estelle (of American Boy fame), while "Take Me Away", a song that conjures up thoughts of white sand and clear blue water, finds Legend handing his pen over to another songwriter for the only time on Evolver. No surprise that the songwriter is current “it” man Ne-Yo. However, the song’s feel is decidedly unlike most of Ne-Yo’s other material, and as much as I like the music of both men, I don’t think John Legend would sound very good singing a stereotypical Ne-Yo song. The great thing about John Legend is that he brings out the best in collaborators who are talented but don’t always put out satisfying work. Black Eyed Pea will.I.am has turned out to be a great songwriting partner, and the three songs he’s written here are strong enough to forgive "My Humps" (but not "Fergalicious"). The Neptunes’ Pharrell Williams, who has been on autopilot for at least half a decade, delivers a winner with "It’s Over", which manages to be hooky without being juvenile as so many Neptunes productions are. The signature horns from Grandmaster Flash’s Freedom are tastefully woven into this midtempo banger, and it’s enough to excuse the album’s low point-a half-assed rap cameo from Kanye West, who really, really needs to put the Auto-Tune machine away. "Evolver" is certainly one of the better R&B albums of 2008, and Legend goes a long way towards proving himself as a jack of all trades. This more electronic, less organic version of John Legend is more or less as enjoyable as the balladeer stuck behind the piano. So I guess that answers question #2, doesn’t it?